Isn’t it true that every honest German is ashamed of his government these days? Who among us has any conception of the dimensions of shame that will befall us and our children when one day the veil has fallen from our eyes and the most horrible of crimes — crimes that infinitely outdistance every human measure — reach the light of day? 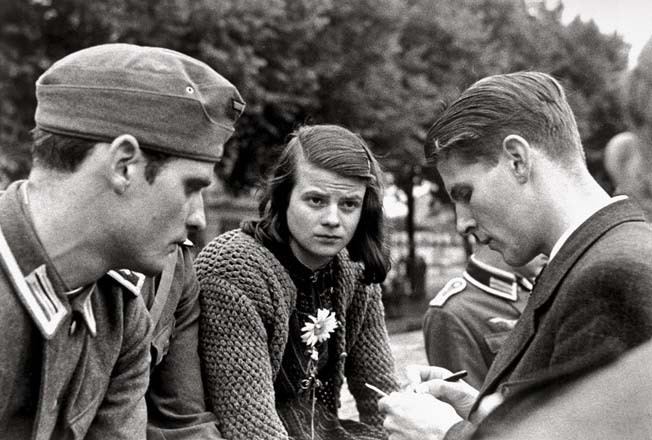 Hans Scholl, Sophie Scholl and Christoph Probst (left to right). Since the conquest of Poland three-hundred-thousand Jews have been murdered in this country in the most bestial way … The German people slumber on in their dull, stupid sleep and encourage these fascist criminals … Each man wants to be exonerated of a guilt of this kind, each one continues on his way with the most placid, the calmest conscience. But he cannot be exonerated; he is guilty, guilty, guilty! 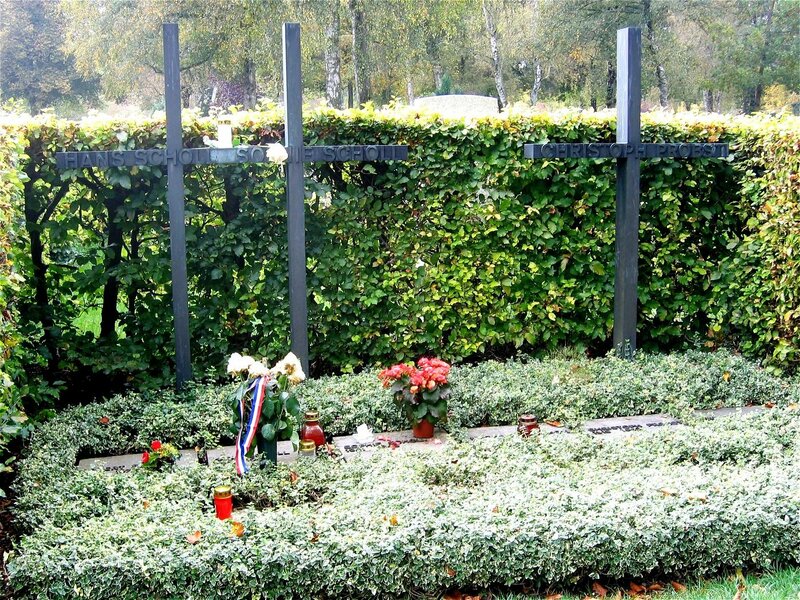 Graves of Hans Scholl, Sophie Scholl and Christoph Probst. By their fifth pamphlet, the group were cranking out several thousand copies on a hand-operated duplicator. On 18 February 1943, to counter Joseph Goebbels’s ‘total war’ speech, the Scholls dumped copies of their sixth pamphlet around the university corridors so that the students would find them when they come out of classes. They were spotted by the caretaker, who called the police, and were eventually handed over to the Gestapo. Being found guilty of treason, they were guillotined along with fellow White Rose member, Christoph Probst, on 22 February. Later that year, the philosophy professor who was the only non-student member of the group, Karl Huber, was also executed along with fellow White Rose activists, Alex Schmorell, who had written much in the pamphlets, and Willi Graf. In vindication of their deaths, the Allied air forces dropped thousands of copies of that final pamphlet over Germany, after Helmuth James von Moltke had a copy smuggled out of the country. Thanks, Doug. I had forgotten about that. 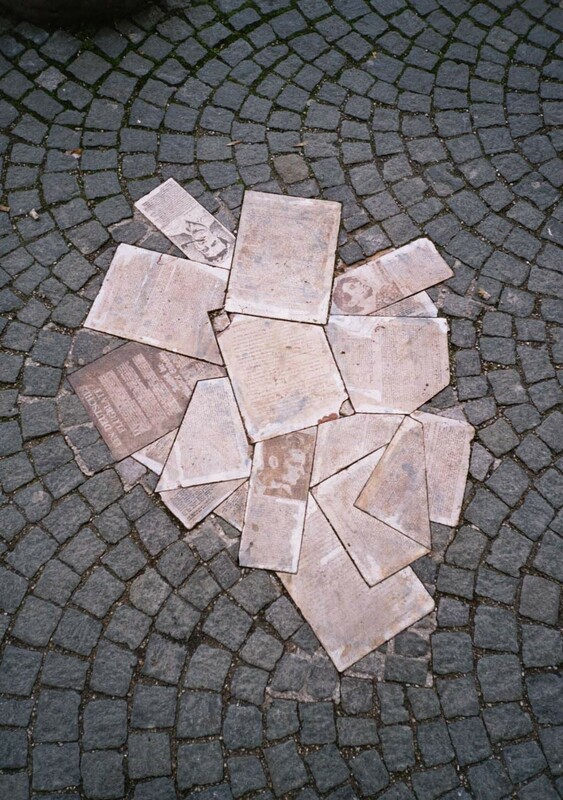 I’m surprised to find out about a few memorials to them outside of Germany, still encouraging student activism.